Trees create a garden. The rest is decoration! I had been thinking of planting a few more small to medium size trees and took my time considering the many possibilities. The franjipani is beautiful and very eye-catching in full bloom in October but not an attractive tree once the dry season comes. It also occupies a lot of space. 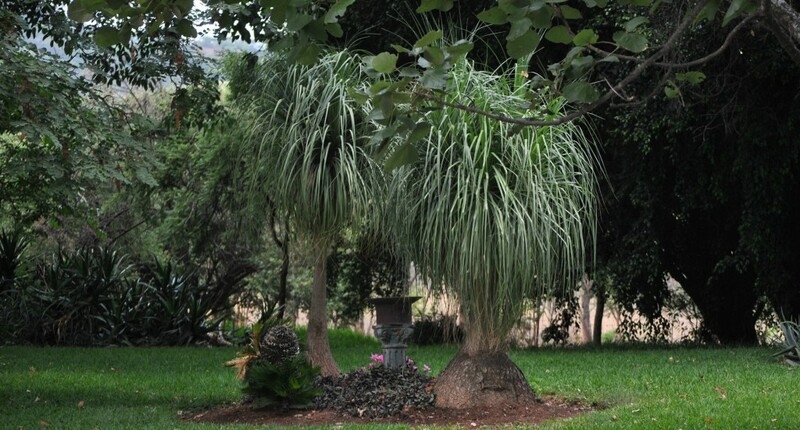 The fabulous flamboyant is spectacular and gives great shade but those large brown seedpods hanging from the branches for most of the year and those dominant roots protruding in every direction are serious drawbacks. Ditto the jacaranda – the roots eventually form huge buttresses and make it impossible to grow anything underneath. An attractive tree is the ficus benjaminii but in a few years it gets very large indeed. Plant one if you have the space but at a good distance (10 metres?) from your house. The bottlebrush fits the bill – medium size, graceful shape and attractive red flowers. It also survives well with minimal water. The melaleuca is another good choice. And then I thought of the curry tree. 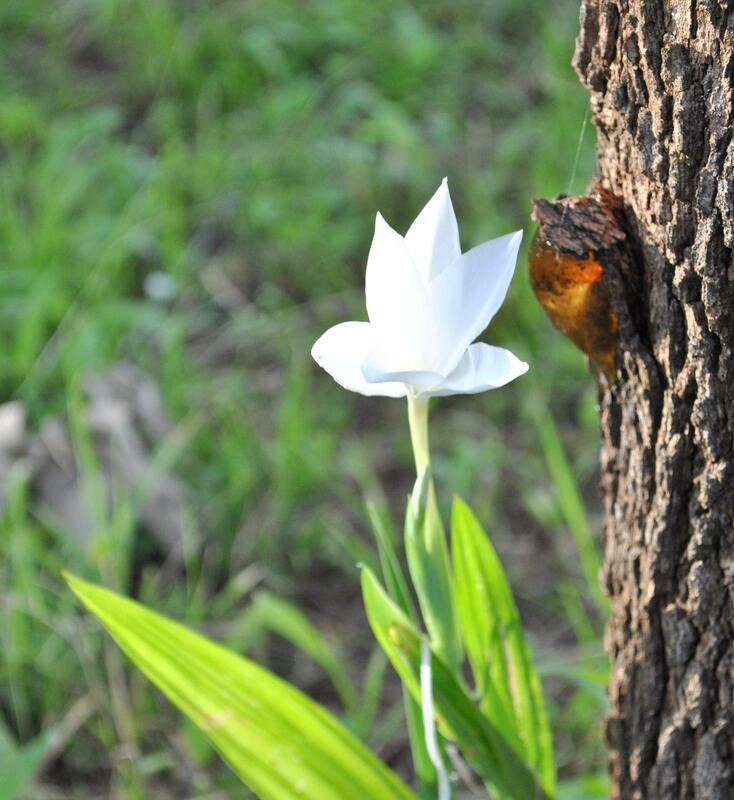 Its leaves are small and shiny, its flowers are neat and pretty and it does not get too big. It is easy to care for and survives the heat. Some of the coniferous trees make a wonderful statement in the garden. The avocado becomes a large tree and the roots are not a nuisance; it gives shade so that it can be under-planted with anthuriums, clivias, ferns and other shade-loving plants. The lychee is another fruit tree that looks great all year round. The macadamia nut tree is another. Palms will fit into any but the smallest garden and are always impressive. The multi-stemmed palms like the golden bamboo palm will take up more space. The Alexander palm is one of the best single-stemmed palms but there are plenty of beautiful palms to choose from. The leopard tree is a lovely choice with markings on its bark. The bauhinia or orchid tree has large white or pink blooms in abundance. Ensure that there is a single trunk by pruning any sideshoots when it is young. Some people refuse to plant the datura, reputed to be poisonous, but as a small flowering tree it has no rivals. The large hanging flowers are heavily scented and come in a variety of colours, white, yellow, apricot and pink. Bees love this tree. It is easy to grow a weeping willow but it does need ample water. Plant it next to a tap. It will soon grow to its full size. Its elegant shape is an addition to any garden. The neem and moringa trees are grown specifically for their contribution to nutrition and health but are attractive small trees nonetheless. Locate your new tree with care. Think of its size in 10 years time. Before you plant, stand on the chosen spot and look upwards. If you are gazing at electric cables or the branches of an existing tree, you are in the wrong place. Dig a very large square hole and fill it with water. Allow the water to drain away. If you are short of water, put a pipe 1 metre long into the hole vertically at the edge. This will enable you to water the tree at root level instead of watering the ground surface. Fill the hole with compost. Then water the compost in order to settle it and add more soil if necessary. Place a stick across the hole to show the soil level and plant your tree so that exactly the same soil level is retained as the tree had in its plastic bag. Water again and ensure the soil does not dry out for the first month.